Not a full-timer yet, but looking to go that route. My state (WA) is rather "picky" about "physical" addresses, have to iron out that wrinkle first. I really like the idea of "hanging out" in different places. When I worked full time, I had a job where I had to perform a lot of travel. I find miss that. Also, "hanging out" in different places, in my opinion, helps keep you mentally sharp, because each place has a different culture and different ways of doing things. Learning about all these differences keeps your brain working. Apparently, in Ocean Shores, WA, it's legal to own a piece of property and just put RV hookups on it. There are many lots for sale where you can either do that or you can build a home, no pressure to build a home. I bought a lot recently, and it had the RV hookups, but I can optionally build a home. I'm going to use it as a place to "park" between RV trips. And I'm using a UPS Store in a nearby city for a mailing service. Now, there is a bit of a "catch." 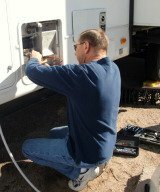 City code requires that if you are using the property for RV hookups, you can't be there more than 90 days a year, and the 90 days does not have to be consecutive. NO PROBLEM. I plan not to be there that much so the 90 day limitation won't be an issue. We use the Escapees mailing service as our permanent address and have been very pleased with it. They will stay in touch with you via email. If you are expecting something important like debit/credit cards, they will be glad to send them to your current location immediately. We get our routine mail sent to us once a month. Theirs is the only mailing service address approved by the IRS too. Escapees.com will give you an address. Many fulltimers use this organization. We plan on using this for our mail when we go fulltime. Post an update on how it's going with Washington State and full-timing status. We'd love to know how you get the details worked out since they are so picky about it.